The location was great! The sunset on the beach was beautiful. Didn't have to worry about traffic and the restaurants nearby were amazing! Cool airy apartment. 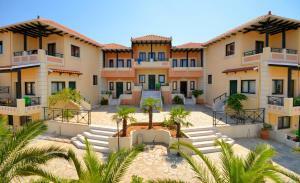 We were only there overnight and really did not see much of the Aloni Suites. We had a great time at Aloni Suites. The apartments are bigger than described (ours was well over 60 sq.m.) so very spacious and comfortable. The place was quiet in September, we mostly had the pool to ourselves, and the views are unbeatable. I would suggest a car, as the walk to the beaches, stores and restaurants (except Bahar) is longer than I would enjoy in the summer heat (but then I am no walker). The quality-price ratio is excellent, so I can definitely recommend Aloni. Vasia, thank you and I hope to see you and Colinda in June. We had rented car, so we didn’t face any transport problem. Stavros beach under the mounteen was perfect for children (3 minutes trip) - there is lagoon without waves and wind. There are several shops in Chorafakia, Irena tavern (1 minute trip). Chania is situated in 12 km (15 minutes trip). Aloni Suite’s pool is excellent!!! Beautiful dusks. 15 apartment is really nice. The location was away from the touristy parts. Stunning views. Lovely pools and peaceful atmosphere. Friendly and easy-going people; every day (!) 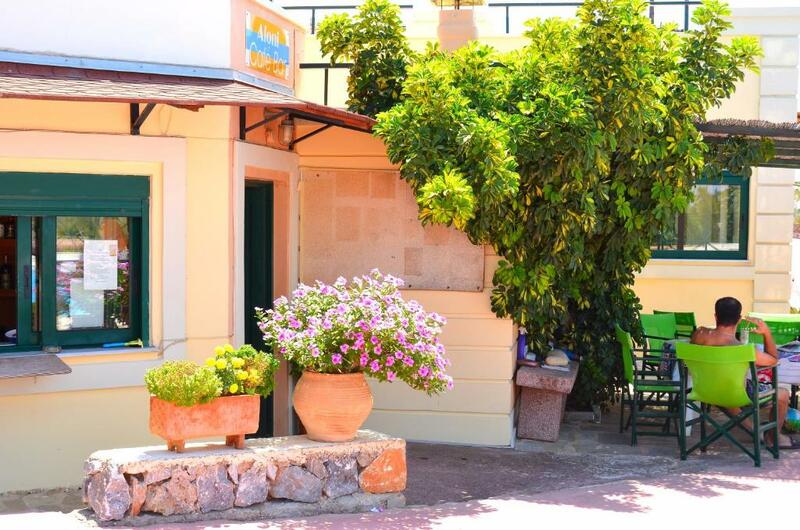 cleaning of the spacious appartment, good location fairly close to very nice beaches and beautiful, cozy and buzzing Chania with so many places to enjoy a bite or drink. Last week was a quiet period (school holidays in Greece were just over), so it felt the very nice swimming pool was "sort of ours". Great views too. We would definitely recommend the Aloni Suites! 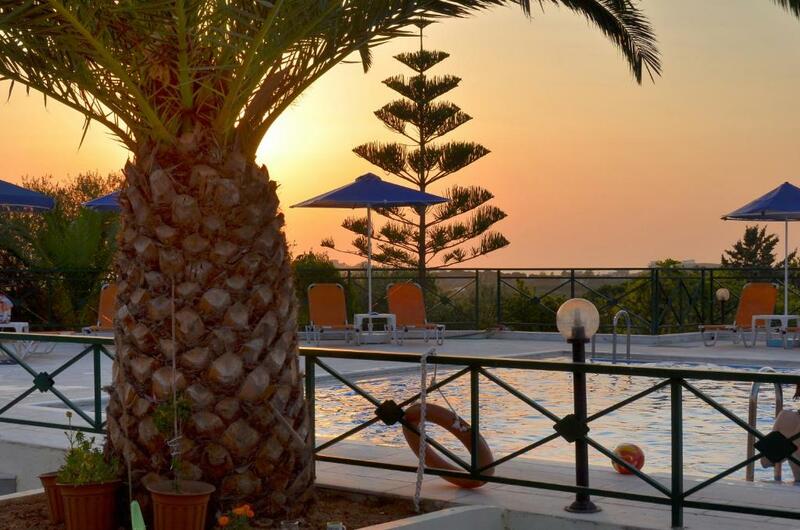 Lock in a great price for Aloni Suites – rated 8.6 by recent guests! Aloni Suites This rating is a reflection of how the property compares to the industry standard when it comes to price, facilities and services available. It's based on a self-evaluation by the property. Use this rating to help choose your stay! One of our top picks in Chorafakia.The family-run Aloni Suites lie in Chorafakia village, in the peninsula of Akrotiri with distant views of the sea and spectacular sunsets. Tersanas Beach is 0.6 mi away and Stavros Beach is 0.9 mi away. 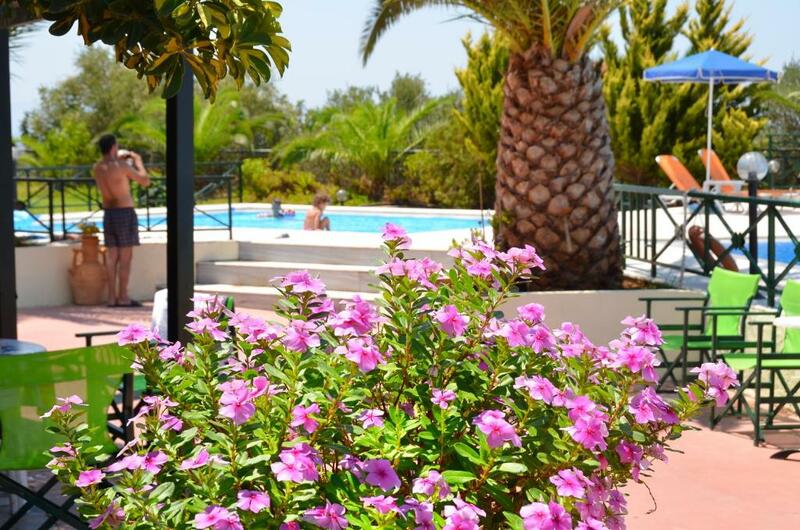 In addition to the main swimming pool and adjoining children’s pool there is an indoor complex containing heated swimming pool, hot tub, steam room, sauna, gymnasium and billiards’ room. Traditional home-cooked meals and refreshing drinks are served at the on-site poolside bar. Supermarkets and taverns can be found a 5-minute drive away and Kalathas Beach is at a distance of 1.2 mi. The area features sites of historical and religious interest, monasteries and caves and wonderful walking paths. 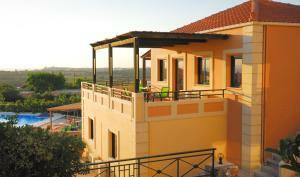 Aloni Suites are located 4.3 mi from the airport, 7.5 mi from Chania and 9.3 mi from the port of Suda. When would you like to stay at Aloni Suites? Including a balcony, some apartments have an extra bathroom. 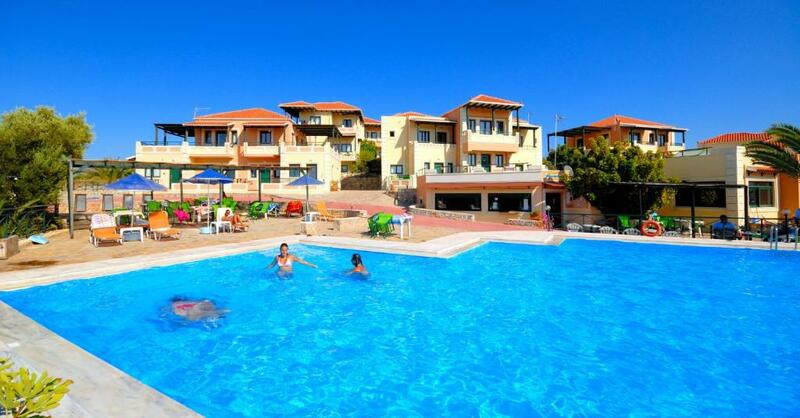 Including a balcony with a pool and sea view, this apartment consists of 3 bedrooms on the upper level. 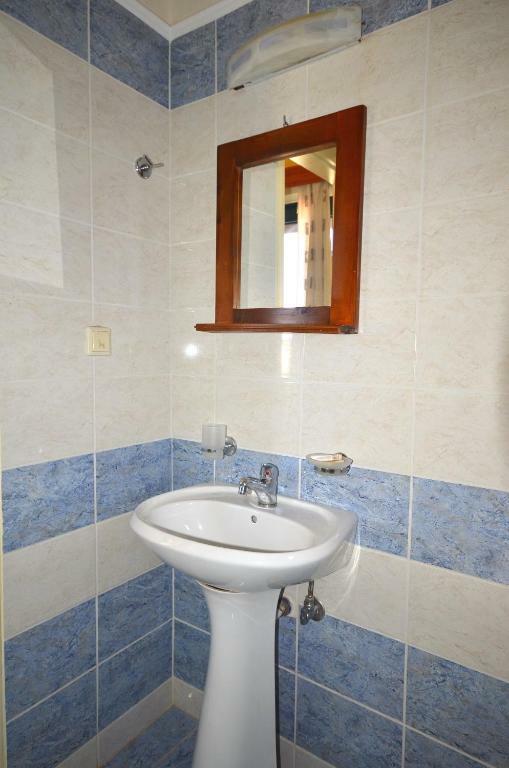 It has 3 bathrooms. 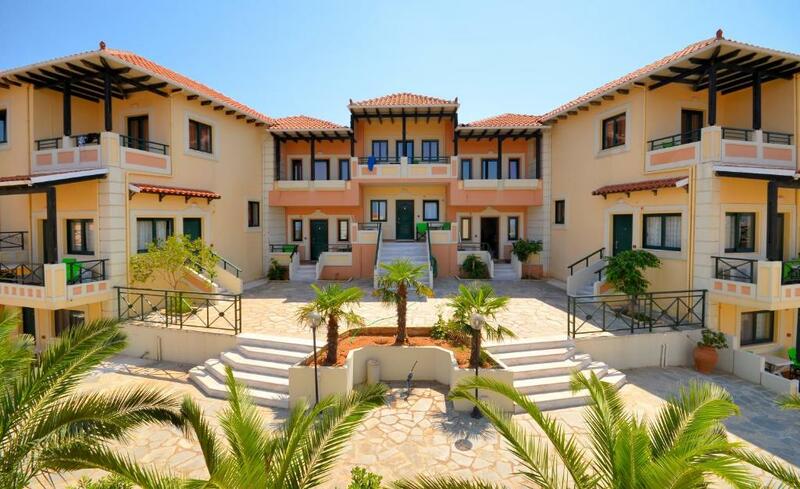 Featuring a balcony with a sea view, this apartment consists of 2 bedrooms on the upper floor. House Rules Aloni Suites takes special requests – add in the next step! Aloni Suites accepts these cards and reserves the right to temporarily hold an amount prior to arrival. Guests arriving after 22:00 should let the property know in advance. Please inform Aloni Suites of your expected arrival time in advance. You can use the Special Requests box when booking, or contact the property directly using the contact details in your confirmation. nothing - everything as described and as in the photos. Spacious. Great pool, wonderful staff. Family friendly. Wasps on the terrace. Every morning wife and children were afraid of them. You will need a car to explore the area and lovely beaches near and far. We stayed here for 2 weeks with our teenage boys - apartments were huge, bigger than picture showed, fab air conditioning too! Most upper rooms had a balcony, where we could watch the amazing sunsets. Pool area lovely, little bar/cafe served amazing food till late. Kitchen was good, good size fridge and freezer, electric oven, microwave, kettle, toaster. Only slight issue in that the apartment was for 6 people but there were no bowls, only 1 small saucepan, and tiny glasses. Apartments were cleaned every day. Kids and husband loved the gym, and enjoyed playing pool. We hired a car, which I would recommend, beach was 5 mins by car, safe, clean, we got paddleboards, kayaks, swam to the island... Chania old town well worth a visit - go into the back streets to eat rather than the harbour front - can recommend To Xani. The tavernas down the road are good if you don't want to drive, Ramblers did fab burgers for the kids, and a good choice otherwise for anyone who didn't want burgers! Bahar well recommended, particularly for their desserts - hot kiss particularly!! 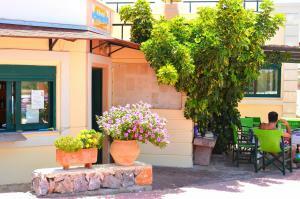 The location is perfect, although you need a car, since its about a 15' drive to the center of Chania. Still there are plenty of supermarkets, pharmacy and restaurants around, in the village of Chorafakia. Our apartment was big and comfortable, with a nice covered veranda, that you could sit and enjoy the view. Big pool and an extra smaller one for the kids. Also a big parking lot. The apartment was getting cleaned every day and every 3 days the towels and sheets were changed. 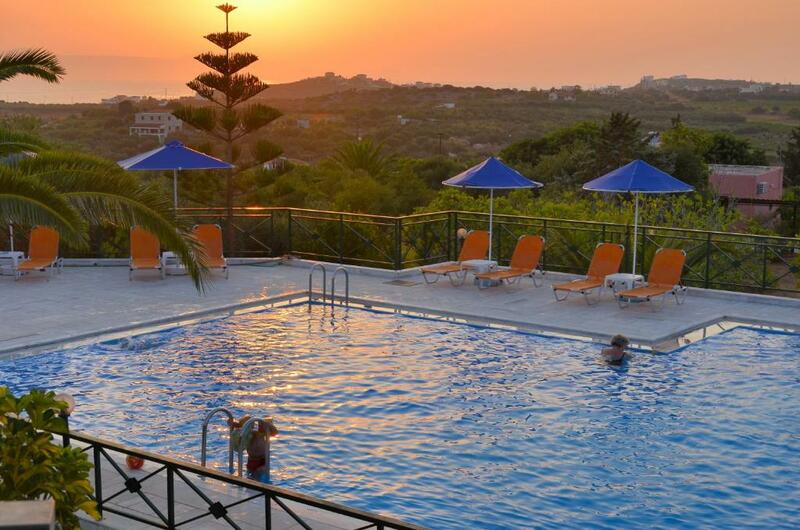 Amazing views from the pool particularly in the evening as the sun sets . The kids had a fantastic time and wouldn't hesitate to recommend.... Will definitely be returning. Altough we could have hired a car which may have given us better and safer access we chose not to on this occasion. Close to airport. Quiet location outside small village. Lovely rural walks. nice secluded small beaches nearby. Spacious apartment. Bus stop to Chania nearby. Owner very helpful.. Beautiful views of sunset from apartment.